Soak black-eyed peas according to package in cold water overnight. 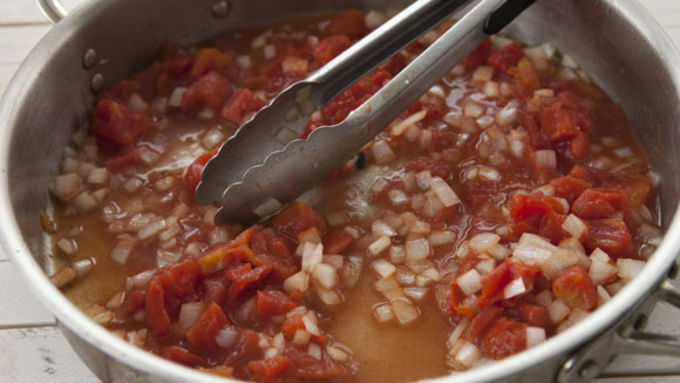 When ready to cook, bring a large pot of water to a simmer. Season water with a big pinch of kosher salt and a few bay leaves. 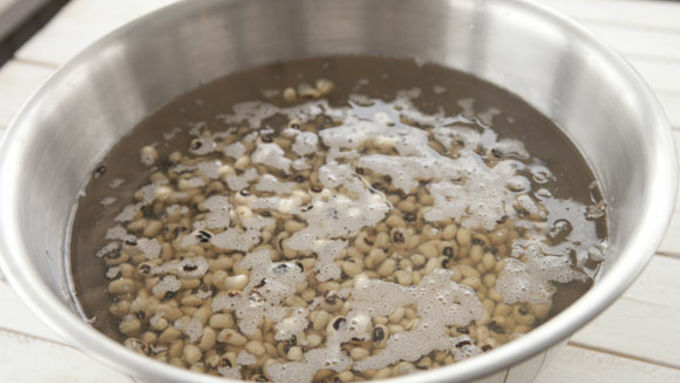 Add black-eyed peas and simmer until tender, about 30 minutes. 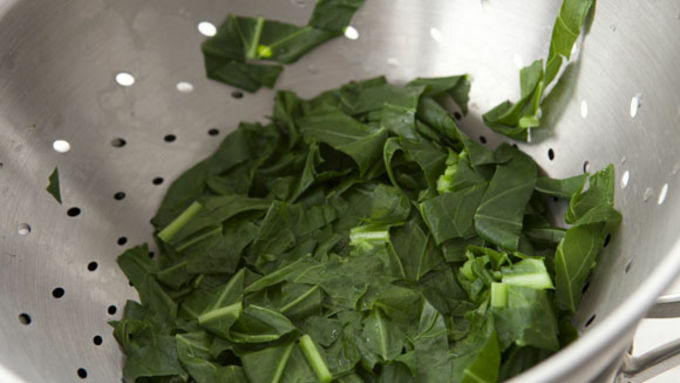 Roughly chop collard greens and blanch in simmering water for 60 seconds. Drain and set aside for later. 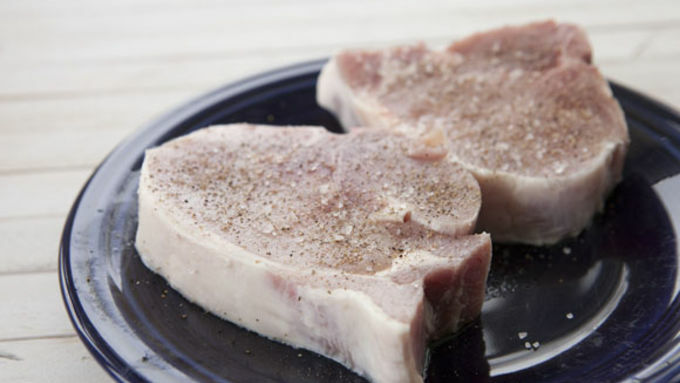 Season pork chops with kosher salt and black pepper well on both sides. In a large, heavy, oven-safe pan, heat olive oil over medium heat-high heat. 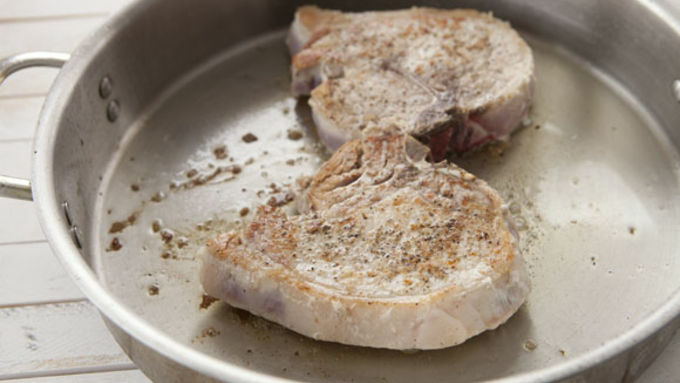 Once hot, add pork chops and sear for 4 minutes per side. Also, preheat oven to 350°F. Remove pork chops. Add diced onions to large pan and turn heat down to medium. Cook for a minute until onions soften. Add tomatoes and chicken stock to pan and season with a pinch of salt, pepper, and red pepper flakes. 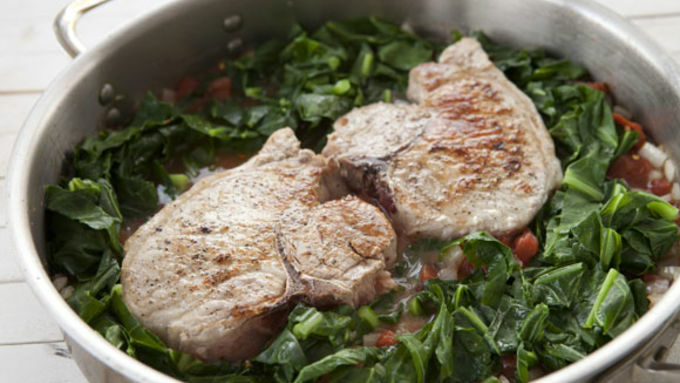 Add collard greens to pan and add pork chops back in. Nestle chops down into the vegetable mixture. Add pan to oven, uncovered, and let braise for 15 minutes. Remove pan from oven and let cool for a few minutes. 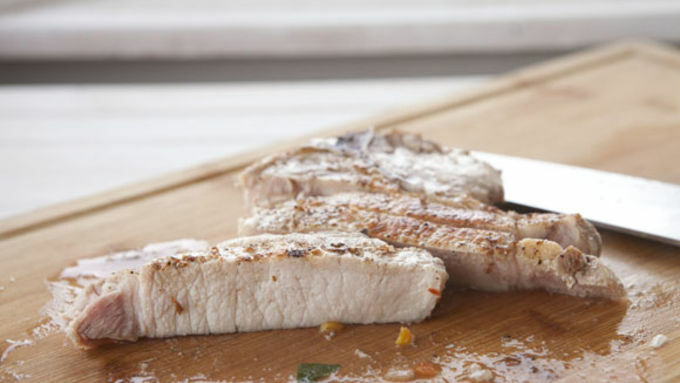 Then remove pork chops and slice into strips. Ladle black-eyed peas into a few bowls. Spoon in some of the cooking liquid as well. 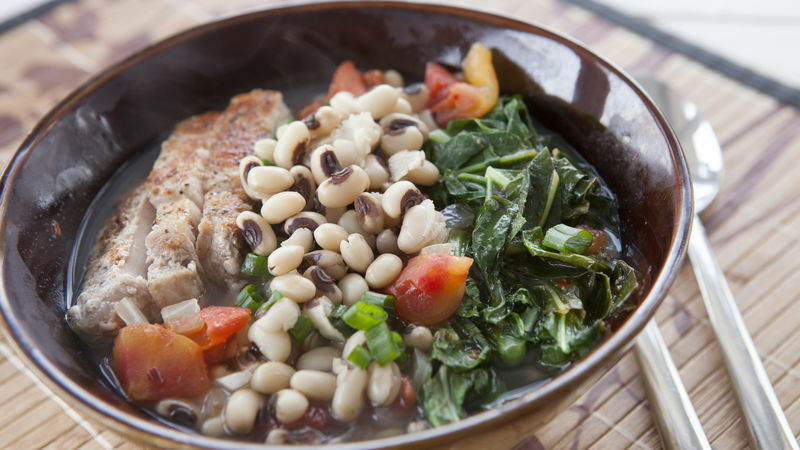 Top peas with collard greens, onions and tomatoes, and a few strips of pork. Garnish bowls with chopped scallions and serve immediately. Growing up, my family wasn’t much for traditions – and they definitely weren’t superstitious. All of that changed, though, on January first of every year when the world stopped so we could eat black-eyed peas. They are supposed to give you good luck for the entire year and I always figured that it was worth a shot. Even if the rumor isn’t true, at least you’ll get a good meal out of the deal! A lot of black-eyed pea recipes involve a big pot of soup or stew, but I like to split up the ingredients a bit. 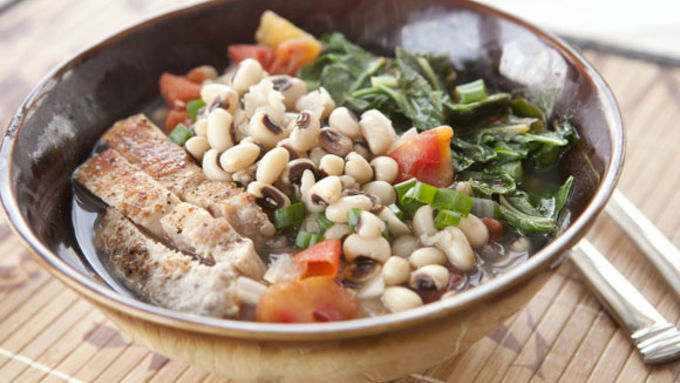 My Good Luck Bowls feature black-eyed peas (of course) along with braised pork chops and collard greens. It’s perfect for a cold New Year’s Day meal. 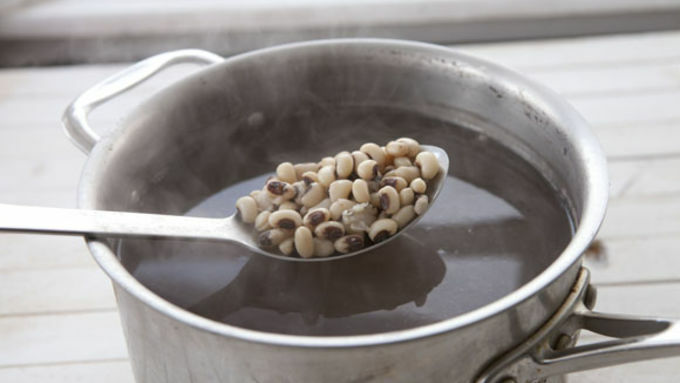 Black-eyed peas are actually a legume, like beans, which means they are best cooked by soaking them overnight in cold water. Before you soak them, be sure to look through them and check for small pebbles. Sometimes there will be some dirt or pebble in with the peas – that’s just not a good way to start the New Year! And if you're short on time, most black-eyed peas will have a quick soak method on the package if you didn’t plan ahead. When you’re ready to serve, spoon in some black-eyed peas in each bowl. Add a few spoonfuls of the cooking liquid from the peas and then top the dish with some collard greens, a few strips of pork, and some chopped scallions. I’m not sure if I believe in good luck, but I’ll take any excuse to eat this meal!